Nashville is still picking up the pieces after flash floods early this month poured about a foot of rain over the city. And not spared was Soundcheck Nashville, the town's largest music storage warehouse, and as it turns out, the storage facility of choice for three quarters of Nashville's artists and musicians. 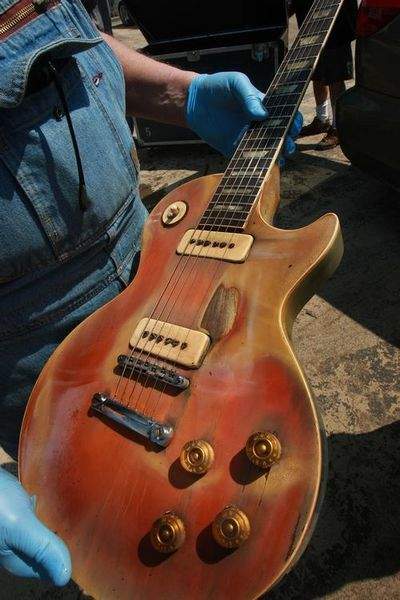 It is estimated that 1,000 guitars and 2,000 amplifiers were damaged at Soundcheck, many of which were vintage instruments and irreplaceable -- Chris Leuzinger's 1952 Les Paul Gold Top was rescued from under 3 1/2 feet of water that flooded the warehouse. Sadly also, Soundcheck seems to have been under-insured given the extent of this calamity. Meanwhile Nashville's own George Gruhn, Joe Glaser and Ed Beaver, together with 20 other volunteers have begun the task of assessing the damage and sending out the more valuable instruments for repair in neighbouring states. Said Glaser, "We're all just motivated by one thing here: We want to save Nashville's guitars. This is our history here."